Window cleaning is classified as high rise if the building has more than 3 stories. 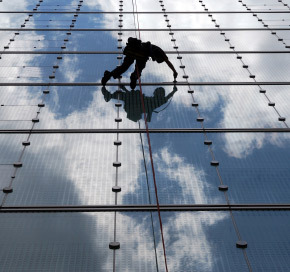 ABI has an experienced high rise window cleaning staff trained in industry standard techniques and OSHA and ANSI safety procedures. Safety is our number one concern and we have never had a lost time accident. We carry commercial liability and workers compensation insurance. Additionally, we have a mobile roof anchor system if your building is not equipped with one. As with any other service that we offer, we stand by our work and have a 100% satisfaction guarantee. Contact an ABI representative today to schedule a site visit.